A cantor friend of mine pointed me towards this new podcast during a discussion about the rather lofty, almost performance piece emphases I'm seeing in some sectors when singing for the divine services. Simply put, I'm not a fan. While I'm all for well-done music, I find the Liturgy-as-Stage-Production where the music is so complicated and extravagant to be a hindrance to prayerful reverence rather than an aid to it. Could someone who attends church regularly sing along? Is it so polyphonic or layered that you can't really tell what is said? Is it glorifying God or the cantor? The second podcast from this series tackles that topic directly. Give it a listen and tell me what you think. 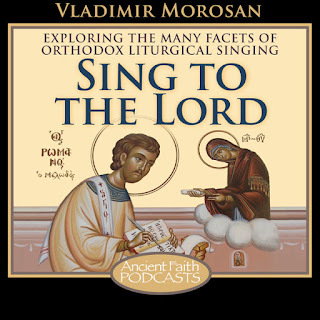 (AFR) - “Sing to the Lord” is a program devoted to exploring the various aspects of Orthodox liturgical singing and all manner of related topics. The program will explore the theology of singing and Orthodox worship over the centuries, different types of hymns and genres, the origins and structures of various chant systems, and the various hymnographers and composers. We will hear the music itself and discuss ways of listening to the hymns, understanding them, and ways of learning to internalize them so that they speak to us more clearly, and help us to pray.